Miraculously, the interior is still standing, and the famous stone archways are still bearing weight. 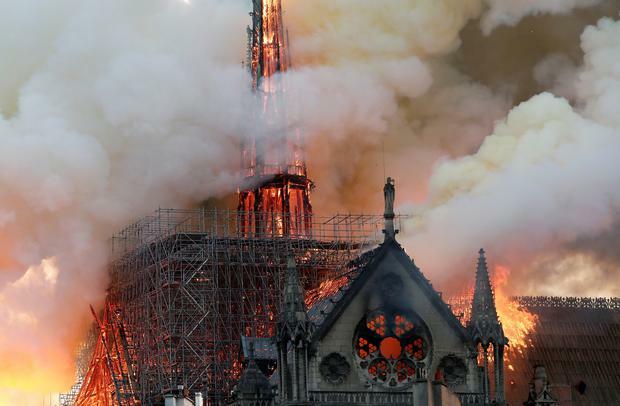 In what might be the best news possible, under the circumstances ... the Paris police chief just said Notre Dame's structure has been saved, and the fire stopped from spreading to the northern belfry. In fact, they say both towers are going to be safe. The international news agency based in Paris disclosed: French fire services say they are "not sure" if the Notre Dame fire can be stopped. The deputy interior minister said saving Notre Dame "is not certain." The fire has sadly reached the left tower. Macron also arrived on the scene moments ago. He had previously tweeted, "Our Lady of Paris in flames. The emotion of a whole nation. Thought for all Catholics and for all French. Like all our countrymen, I'm sad tonight to see this part of us burn." A Notre Dame spokesperson says ... "Everything is burning, nothing will remain from the frame." Sources believe the inferno may have been caused by recent restoration of the church. It is currently unknown what caused the fire or if any people were inside the church at the time. A church spokesperson has told French media all of Notre Dame Cathedral's frame is burning after the spire collapsed. President Macron and Prime Minister Edouard Philippe visited the scene. The cathedral's roof and famous spire have collapsed in flames. Firefighters are on the scene trying to battle the blaze but are reportedly having major problems due to their ladders being too short to attack the fire. The cathedral's roof has also completely collapsed. The Cathedral is one of the first buildings in the world to use the flying buttress, which architects installed long after the original design to alleviate the wall's stress fractures that began to occur as the walls grew higher. The Cathedral has suffered damage and deterioration over the centuries, especially during the French Revolution in 1786. It was saved from possible destruction by Napoleon, though who crowned himself emperor inside the cathedral in 1804 -- and later restored. Its notable central spire was actually added during restoration in the 19th century. One bit of good news is that 16 statues that sit atop Notre Dame representing the 12 apostles and 4 evangelists were removed just last week as part of the restoration project.